in the name of religion. Second, in many parts of the world, we live in an era of increased hateful discourse, triggering the polarization between groups, as well as the rise of populism and xenophobia. Religion can certainly be misused as a force to divide people and to violate human rights. But interfaith dialogue can also be used as a positive force to bring people closer together and to revitalize trust between groups. It is of course important to recognize that perpetrators of violence represent comparatively small segments of the various religious communities to which they belong. To decrease tensions, these communities must overcome the culture of silence and denounce violence waged in the name of religion, without using excuses or justifications. Care must also be taken to avoid the stigmatization of entire communities on account of violence perpetrated by individual members; and focus on building bridges rather than erecting walls. The phenomenon of fear has to be taken very seriously. As a previous Special Rapporteur on freedom of religion or belief has stated: “fear can escalate to collective paranoia, and contempt can lead to acts of public dehumanization.”(1) He raises the case of anti-Semitic conspiracy theories, which may be the most intensively studied and one of the most malign examples. The toxic mix of fear and contempt can frequently target religious minorities or individual dissenters to build conspiracy theories around them. This can lead to hateful discourse and polarization of society, with a breakdown of trust between groups and individuals — as well as between citizens and their trust in public institutions. All forms of dialogue can contribute substantially to the question of trust-building and challenging stereotypes. Religious and belief groups can play a positive role in de-escalating tensions and rebuilding eroded trust between groups and/or the state. Pluralism needs to be constantly nurtured for it to survive – and inter-faith/intra-faith dialogue is part of the solution. I strongly believe that there is a need to deconstruct stereotypes and put forward success stories of shared common values, or in other words the “golden rule”. Humanity is bound by one common belief. A “Golden Rule” is frequently voiced across many faiths and philosophies; it is the rule that defines one’s relationship to the Other: treat others as you would like to be treated. There is a universality to the values of coexistence, compassion, empathy and solidarity; it runs like a common thread across many nonviolent convictions. This core belief implies reciprocity and a commitment to equality. In trying times, this message needs to be reinforced, at every occasion. The Fez process: the Special Adviser of the Secretary-General on the Prevention of Genocide has worked on bringing religious leaders together. His plan of action, known as the “Fez Process”, stemmed from the need to better understand, articulate and encourage the potential of religious leaders in preventing incitement and the violence that it can lead to, and to integrate the work of religious leaders within broader efforts to prevent atrocity crimes. Given the particular influence that religious leaders have, the Office has sought to engage them to prevent incitement to violence around the world. The Beirut Declaration: Another UN initiative occurred in March 2017, when the Office of the UN High Commissioner for Human Rights launched its initiative on “Faith for Rights”(3) with an expert workshop in Beirut. This initiative reflects on the deep, and mutually enriching, connections between religions and human rights. The objective is to foster the development of peaceful societies, and pledges towards 18 commitments, including: free choice, equal treatment, non-discrimination, the rights of minorities and the obligation to denounce all instances of advocacy of hatred that incites to violence, discrimination or hostility. In addition to forums involving the United Nations, there are numerous initiatives that have been initiated and conducted by faith-based groups, civil society actors, or indeed by states and regional organisations. Some of these are implemented at the national level, while others are regional or transnational. Many of these serve as antidotes to the so-called ‘clash of civilization thesis’, while others respond to more immediate national or regional challenges. There may even be instrumental motives attached to these ‘religion diplomacy’ efforts. When addressing the question of inter-faith dialogue, there is a need to ensure that the right people are at the table to achieve the objectives of the gathering. Indeed, there are many forms of interfaith dialogue, and it is important to set the goals straight – in order to avoid the pitfalls! Several questions can be raised, such as: does this initiative aim at dialogue between religious leaders or grassroots activists? Is this a symbolic meeting or does it aim at future practical cooperation in a variety of fields? How is the dialogue planned to avoid possible negative effects, for example, disappointment or frustration? How inclusive is participation? Are women well represented? If the state is a facilitator, how to ensure that this is not an exercise in double standards – where one speech will be made during the event, and an opposite attitude will transpire in diplomacy? All these questions are crucial to discuss and tackle beforehand in order to achieve success. Finally, I would like to mention the question of intra-faith dialogue, and highlight several remarkable initiatives advanced in the Islamic world at civil society and governmental level. A letter was signed by numerous Muslim theologians, lawmakers and community leaders who wrote an open letter to Abu Bakr al-Baghdadi, leader of ISIS. It included a technical point-by-point refutation of ISIS’ actions and ideology based on the Quran, and using references to other normative texts. There were also other initiatives, such as the Amman Message (notably declaring that a person is an apostate is impossible and impermissible in Islam) and the Marrakesh Declaration (a statement made in January 2016 by over 250 Muslim religious leaders, heads of state, and scholars, which champions “defending the rights of religious minorities in predominantly Muslim-majority countries). All of these initiatives are tools that show how interfaith/intra-faith dialogue can help prevent violent extremism. It can be especially effective when there is a deep commitment to create inclusive societies that leave ‘no one behind’. Where dialogue can enhance understanding, promote empathy, build trust, facilitate cross-boundary solidarity, and is supported by policies of inclusion, it can contribute to fostering resilient societies that can overcome intolerance and hatred that often undergird extremism and incitement to violence. 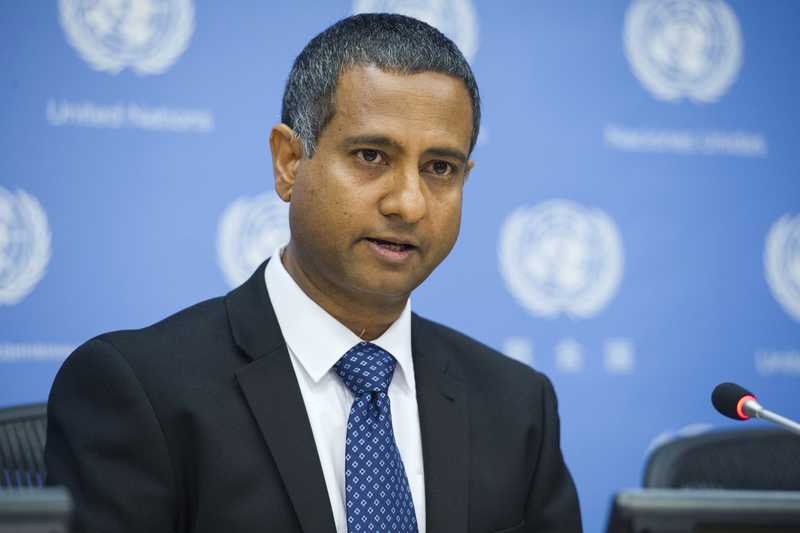 Mr. Ahmed Shaheed is the United Nations Special Rapporteur on freedom of religion or belief. The Special Rapporteur on freedom of religion or belief is an independent expert appointed by the UN Human Rights Council. The mandate holder identifies existing and emerging obstacles to the enjoyment of the right to freedom of religion or belief and present recommendations on ways and means to overcome such obstacles. Mr. Shaheed is Deputy Director of the Essex Human Rights Centre. He was the first Special Rapporteur of the Human Rights Council on the situation of human rights in the Islamic Republic of Iran since the termination of the previous Commission on Human Rights mandate in 2002. A career diplomat, he has twice held the office of Minister of Foreign Affairs of Maldives. He led Maldives’ efforts to embrace international human rights standards between 2003 and 2011.